“Screams, shrieks, whoops, bawls, howls, hollers, roars swept through the ball-yard with the weird noise raised by cow bells, auto horns, whistles, rattles, and musical instruments,” wrote Damon Runyon about the wild scene at Sportsman’s Park for first World Series game ever played in St. Louis.1 A member of the National League since 1892, the Cardinals had spent most of their existence mired in the second division until they captured an unexpected pennant in 1926. The celebratory atmosphere was tempered only by gloomy and ominous skies with unseasonably cool temperatures hovering in the low 60s. Nonetheless, a record crowd in excess of 38,500 had packed Sportsman’s Park.6 “It would have taken a cyclone, and earthquake, and a tidal wave to have kept St. Louis away from the ball park,” chimed in Harrison in the Times.7 By noon the dark clouds gave way to brilliant sunshine, enabling both teams to conduct batting practice before a sea of red-clad fans. Soon after St. Louis Mayor Victor Miller threw out the ceremonial first pitch, home-plate umpire George Hildebrand yelled “Play ball” at approximately 1:30. Taking the mound for the Cardinals was Jesse Haines, a 33-year-old right-hander with a career record of 96-91 in seven years with the club. Since winning 20 games in 1923, he had struggled with his knuckleball and his fastball had seemingly lost its zip, leading many to wonder if he was washed up.8 An ankle injury limited Haines primarily to relief appearances for the first nine weeks of the ’26 season, but he returned with a vengeance, finishing with a 13-4 record. Nonetheless, few sportswriters gave “Old Jess” a chance against the Bronx Bombers. 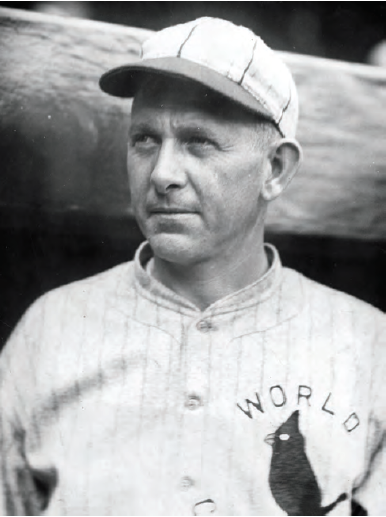 Erstwhile Cardinals skipper Miller Huggins, who guided the Yankees to their fourth pennant since becoming manager in 1918, surprised many by sending 33-year-old southpaw Dutch Ruether to the rubber. Acquired in a trade with the Washington Senators on August 27, Ruether went 2-3 in his five starts with the Yankees to conclude his 10th big-league campaign with a 124-89 slate. After yielding an innocuous one-out single to Billy Southworth in the first, Ruether encountered some trouble in the next frame when Chick Hafey stroked a one-out double down the left-field line, but was left stranded on third. The Cardinals threatened in the third when Haines hit a sharp yet routine grounder to first, pulling Lou Gehrig off the line. According to Harrison, Ruether was late in covering, enabling Haines to reach base.12 Taylor Douthit walked and both runners moved up a station on Southworth’s sacrifice bunt. But Ruether retired Rogers Hornsby and cleanup hitter Jim Bottomley to escape the jam. Under rapidly darkening skies spitting rain, Babe Ruth led off the fourth with a single and moved to second on Bob Meusel’s grounder. Just when it appeared that Haines might be in trouble, the umpires ordered the players off the field. Approximately 30 minutes later, Haines was back on the rubber warming up. Seemingly rejuvenated by the rest, Old Jess quickly dispatched Gehrig and Tony Lazzeri. Unlike Haines, Ruether seemed out of sorts after the delay, yielding a leadoff single to Les Bell and walking O’Farrell with one out. The tenor of the game, and perhaps the entire Series, changed on the next at-bat. Light-hitting Tommy Thevenow hit a tailor-made double-play grounder to second baseman Lazzeri, whose throw to shortstop Mark Koenig forced O’Farrell. According to Harrison, Koenig was slow to cover second and thus “threw from a needlessly awkward position,” and watched as the ball bounded past Gehrig’s ankle.13 Bell rounded third and scored the game’s first run. Buoyed by his offensive heroics, Haines retired the side in the fifth on three deep fly balls, after which the Redbirds took their whacks at Ruether. Billy Southworth lined a leadoff single and advanced to third on Hornsby’s single to center. Bottomley’s grounder drove in Southworth for the Cardinals’ fourth and final run, sending Ruether to the showers. According to the Times, Yankee batters had “tightened up” and were swinging at bad balls.17 Gehrig’s one-out single in the ninth, the team’s fifth hit, barely had a chance to quiet the crowd before shortstop Thevenow scooped up Lazzeri’s lazy grounder to initiate a 6-4-3 twin killing and conclude the game in 1 hour and 41 minutes. The “Yankees had their chances, but they flittered them away,” wrote Vidmer dejectedly. Their “murderous attack ... vanished, evaporated, dissolved, disappeared.”20 In a succinct summation of the game, the New York Times announced: “The Yanks played dully in a dull game.”21 A story of David defeating Goliath suddenly seemed like a distinct possibility. 1 Damon Runyon, reprinted in “Seeing Ourselves as Others See Us,” St. Louis Post-Dispatch, October 6, 1926: 2. 2 Grantland Rice, reprinted in “Seeing Ourselves As Others See Us,” St. Louis Post-Dispatch, October 6, 1926: 2. 3 James R. Harrison, “Cards Lead Series; St. Louis in Ecstasy as Yanks Lose, 4-0,” New York Times, October 6, 1926: 1. 4 “Noisy Fans Tell World St. Louis Is Proud of Cardinals,” St. Louis Post-Dispatch, October 5, 1926: 2. 5 William F. Allen, “New Record Set With 38,500 Fans Packing the Park,” St. Louis Post-Dispatch, October 5, 1926: 1. 6 The St. Louis Post-Dispatch estimated the crowd to be approximately 38,500. Baseball-Reference gives the paid attendance as 37,708 as did the New York Times. 8 Gregory H. Wolf, “Jesse Haines,” SABR BioProject, https://sabr.org/bioproj/person/afeb716c. 10 Graham McNamee, reprinted in “Seeing Ourselves as Others See Us,” St. Louis Post-Dispatch, October 6, 1926: 2. 11 Richards Vidmer, “Koenig’s Error Starts Yankees to Downfall,” New York Times, October 6, 1926: 16. 19 “Cards Hail Haines as a Double Star,” New York Times, October 6, 1926: 17.